However, most browsers have implemented their own caching layer that can override the TTL specified by the server. In fact, some browsers cache for 5-10 minutes, which is an eternity when a region or data center fails and you need to route end users to a different location. Internet Explorer 4.x and later versions modify how DNS host entries are cached by decreasing the default time-out value to 30 minutes. This entry was posted in Browser, Computer, DNS, Firefox, GoogleChrome, IE, Murmuring, Network, Software, WWW and tagged browser, cache, dns, time, ttl on July 1, 2017 by Gea-Suan Lin. This entry was posted in Browser, Computer, Firefox, GoogleChrome, IE, Murmuring, Network, Security, Software, WWW and tagged browser, https, privacy, security, ssl, tls on March 19, 2017 by Gea-Suan Lin. 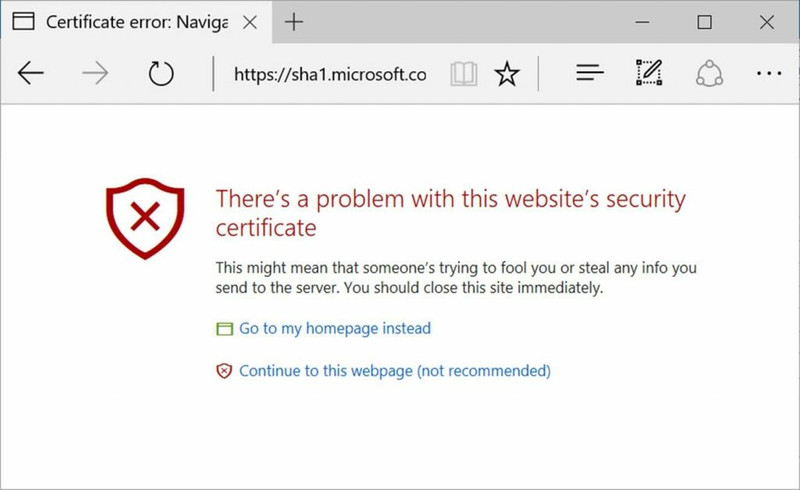 Starting on February 14th, 2017, Microsoft Edge and Internet Explorer 11 will prevent sites that are protected with a SHA-1 certificate from loading and will display an invalid certificate warning. This will only impact SHA-1 certificates that chain to a Microsoft Trusted Root CA. Manually-installed enterprise or self-signed SHA-1 certificates will not be impacted, although we recommend for all customers to quickly migrate to SHA-256. This entry was posted in Browser, Computer, IE, Murmuring, Network, Security, Software, WWW and tagged ca, certificate, deprecation, edge, explorer, https, ie, internet, microsoft, privacy, security, sha1, ssl, tls on December 2, 2016 by Gea-Suan Lin. This entry was posted in Browser, Computer, Firefox, IE, Murmuring, Network, Security, Software, WWW and tagged attack, certificate, microsoft, mozilla, security, sha1, ssl, tls on November 6, 2015 by Gea-Suan Lin.